In 1986, when Voyager swept past Uranus, the probe's portraits of the planet were "notoriously bland," disappointing scientists, yielding few new details of the planet and its atmosphere, and giving it a reputation as a bore of the solar system. Now, however, thanks to a new technique applied at the Keck Observatory, Uranus is coming into sharp focus through high-resolution infrared images, revealing in incredible detail the bizarre weather of the seventh planet from the sun. 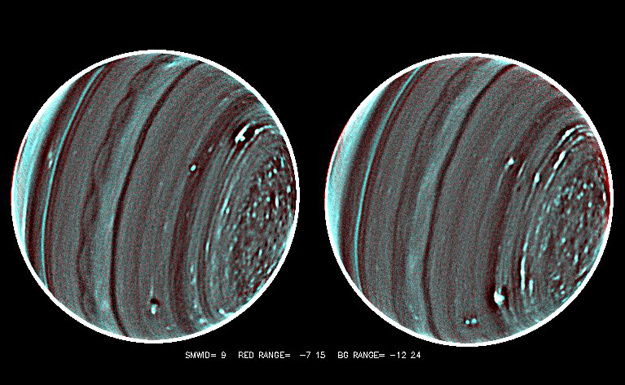 The images were released in Reno, Nev. today (Oct. 17, 2012) at a meeting of the American Astronomical Society's Division of Planetary Sciences and provide the best look to date of Uranus's complex and enigmatic weather. The planet's deep blue-green atmosphere is thick with hydrogen, helium and methane, Uranus's primary condensable gas. Winds blow mainly east to west at speeds up to 560 miles per hour, in spite of the small amounts of energy available to drive them. Its atmosphere is almost equal to Neptune's as the coldest in our solar system with cloud-top temperatures in the minus 360-degree Fahrenheit range, cold enough to freeze methane. Large weather systems, which are probably much less violent than the storms we know on Earth, behave in bizarre ways on Uranus, explains Larry Sromovsky, a University of Wisconsin-Madison planetary scientist who led the new study using the Keck II telescope. "Some of these weather systems," Sromovsky notes, "stay at fixed latitudes and undergo large variations in activity. Others are seen to drift toward the planet's equator while undergoing great changes in size and shape. Better measures of the wind fields that surround these massive weather systems are the key to unraveling their mysteries." To get a better picture of atmospheric flow on Uranus, Sromovsky and colleagues Pat Fry, also of UW-Madison, Heidi Hammel of the Association of Universities for Research in Astronomy (AURA), and Imke de Pater of the University of California at Berkeley, used new infrared techniques to detect smaller, more widely distributed weather features whose movements can help scientists trace the planet's pattern of blustery winds. "We're seeing some new things that before were buried in the noise," says Sromovsky, a senior staff scientist at UW-Madison's Space Science and Engineering Center. "My first reaction to these images was 'wow' and then my second reaction was WOW," says AURA's Heidi Hammel, a co-investigator on the new observations and an expert on the atmospheres of the solar system's outer planets. "These images reveal an astonishing amount of complexity in Uranus's atmosphere. We knew the planet was active, but until now much of the activity was masked by noise in our data." The complexity of Uranus's weather is puzzling, Sromovsky explains. The primary driving mechanism must be solar energy because there is no detectable internal energy source. "But the sun is 900 times weaker there than on Earth because it is 30 times further from the sun, so you don't have the same intensity of solar energy driving the system," explains Sromovsky. "Thus the atmosphere of Uranus must operate as a very efficient machine with very little dissipation. Yet the weather variations we see seem to defy that requirement." The new Keck II pictures of the planet, according to Sromovsky, are the "most richly detailed views of Uranus yet obtained by any instrument on any observatory. No other telescope could come close to producing this result." Sromovsky and his colleagues used Keck II, located on the summit of Hawaii's 14,000-foot extinct volcano Mauna Kea, to capture a series of images that, when combined, help increase the signal to noise ratio and thus tease out weather features that are otherwise obscured. In two nights of observing under superb conditions, Sromovsky's group was able to obtain exposures of the planet that provide a clear view of the planet's cloudy features, including several new to science. The group used two different filters in an effort to characterize cloud features at different altitudes. "The main objective was to find a larger number of cloud features by detecting those that were previously too subtle to be seen, so we could better define atmospheric motions," Sromovsky notes. New features found by the Wisconsin group include a scalloped band of clouds just south of Uranus's equator and a swarm of small convective features in the north polar regions of the planet, features that have never been seen in the southern polar regions. "This is a very asymmetric situation," says the Wisconsin scientist. "There is certainly something different going on in those two polar regions." One possible explanation, is that methane is pushed north by an atmospheric conveyor belt toward the pole where it wells up to form the convective features observed by Sromovsky's group. "The 'popcorn' appearance of Uranus's pole reminds me very much of a Cassini image of Saturn," adds de Pater. Saturn's South Pole is characterized by a polar vortex or hurricane surrounded by numerous small cloud features indicative of strong convection, analogous to the heavily precipitating clouds encircling the eye of terrestrial hurricanes, she notes. Her group suggested a similar phenomenon would be present on Neptune, based upon Keck observations of that planet. "Perhaps we will also see a vortex at Uranus's pole when it comes into view," she says. The phenomena may be seasonal, Sromovsky notes, but the group has so far been unable to establish a clear seasonal trend in the winds of Uranus. "Uranus is changing," he says. "We don't expect things at the north pole to stay the way they are now." The scalloped band of clouds near the planet's equator may indicate atmospheric instability or wind shear: "This is new and we don't fully understand what it means. We haven't seen it anywhere else on Uranus."